Today has been all about desperately trying to get back into my routine. While there's still lots on my list to be crossed off, I'm proud to report that I have a meal plan after a couple of weeks without one. It makes me feel like the rest of the week can run aground just as long as I know what we'll be eating. Weird right? Anyway, here's the list. Though I didn't really make a menu the last few weeks, we did try a few recipes. Crockpot brown and maple sugar pork tenderloin: This was pretty good. It got a thumbs up from the hubby but it still didn’t have the sweet flavor I thought it would. Being cooked in the crockpot made it a little dry, but it was fine overall. I might make it again. Veggie and tofu stir fry: - I ended up using broccoli instead of the bok choy as I couldn't find the latter anywhere. We really liked this dish, but there didn't seem to be enough oil in the pan so many of the veggies got a little charred, though I stirred it fairly constantly. As well, there wasn't much of the sauce, especially since I served this over rice. I'll likely make this again, but add more oil and up the amount of sauce. Fontal polenta with mushroom saute: This was really, really good. I could only find the pre-made polenta in the store so I rolled with that and sliced it, sauteed it in a little butter, and laid it in the bottom of a casserole dish. I used white wine instead of the lemon juice (as suggested in the comments) and added a touch of cream to the mushrooms. It was really good. Very rich though. I will probably make it again. Broccoli cheese soup: This was pretty good and fairly easy. We consumed quite a bit of it. I may make it again. Mushroom soup: I think I've actually made this before. It came together fairly quickly and we ate it up. It is rather rich though with all the cream and cheese. I actually ate the leftovers myself and that's pretty rare for me. I will probably make it again, though it might not be often because of the extreme richness of it. Grilled chicken with lemon basil pasta: This is a FAVORITE of mine. I've made it many, many times (with and without the chicken). The lemon and basil give it a light, refreshing taste while the cheese and cream make it decadent. It comes together pretty quickly also. The leftovers always get eaten no matter how much I make. It's delicious and will definitely be made again and again. Crispy lemon tilapia: This is another recipe that I've cooked before. It comes together quickly and gives the fish a little umph. I'll use this recipe again I'm sure. Whew. . .that was a long list. I do apologize! I've got one more quick thing to add; I marked down a few items in the Etsy Shop this morning if you're interested. One of the items marked down this morning. I've got a pile of new stuff to be added to the shop but it seems to be taking me forever to get the pictures edited and the descriptions written, so please stay tuned! 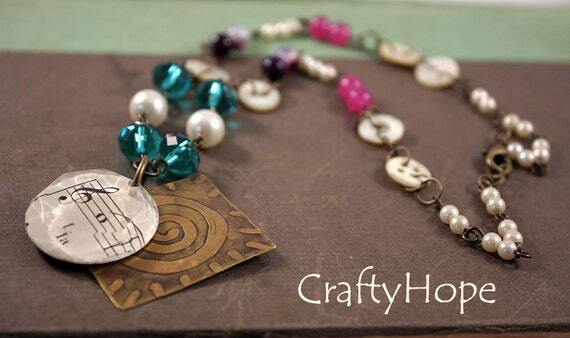 Here's a link to the sale section of the CraftyHope Etsy Shop. I pinned the Parmesan Orzo. I like cooking orzo but don't have many recipes. This one sounds delicious. Berry, Oh I hope it is. It's a recipe I've had saved for a while and was looking for something a little different for this week. I'm looking forward to it. Ihope you like it too. 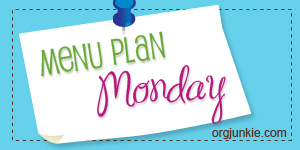 I always feel better about the week if I have a menu plan. Unfortunately it rarely happens because of our hectic schedules. The grilled chicken with lemon basil pasta sounds yummy! Yummy everything sounds really good. I am all about subsituting ingredients if I don't have something or don't like what the recipe is calling to use. Have a great week. Good for you! I can't plan meals to save my life! That Chicken and Basil Pasta sounds yummy!